A Caversham curate who has Type 2 diabetes is backing the launch of a new campaign and free book, '100 things I wish I'd known about diabetes', sharing her tips on living with the condition with others who have been affected by diabetes. The free book, published by Diabetes UK, is full of everyday tips offered by people living with diabetes for other people living with diabetes, their families and friends. Margaret Dimmock, 72, is an assistant curate in two local parishes for the Church of England and was diagnosed with Type 2 diabetes in 2014, a few months after a stroke, a complication associated with the condition. Low fat foods like yogurts can sometimes be higher in sugar, so always check the ingredients on the label. She said: “I gave the tips as I wanted to give helpful lifestyle ideas to other folks who have helped me. I am a member of Diabetes UK and find the magazine, Balance and their recipes interesting. With new figures release today by the charity showing that 700 people a day are diagnosed with diabetes in the UK - that's one person every two minutes - the charity says that people often say their diabetes diagnosis leaves them isolated and with unanswered questions. To help people get a better understanding of their condition and some key things about it, the charity has enlisted the support of Margaret and others with experience of diabetes to share advice across every aspect of life with the condition, from going on holiday and eating out, working out and managing diabetes alongside work, relationships and more. 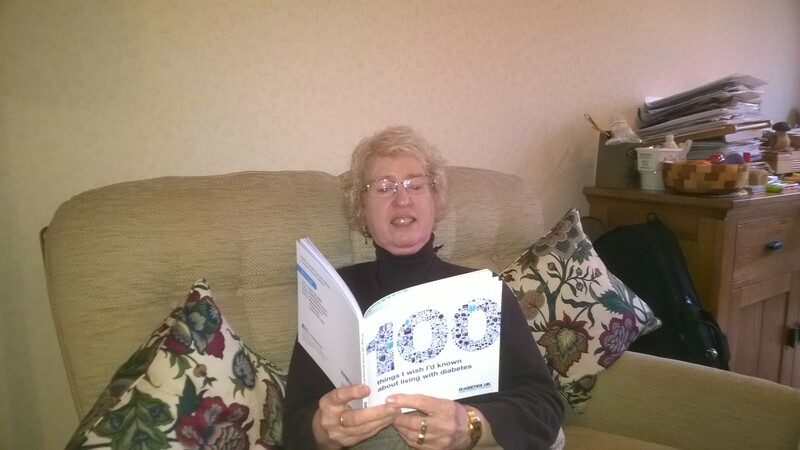 Jill Steaton, Diabetes UK South East Regional Head, said: “We are really grateful to Margaret for drawing on her own experience of living with diabetes to share advice with others who are affected by the condition in our new book. All tips submitted were reviewed by the charity's clinical team and the final 100 tips included in the book were shortlisted by a panel of people with diabetes. The book also contains tips from Diabetes UK celebrity supporters including actor Jonny Labey, rugby player Chris Pennell and Sky News's Stephen Dixon, all of whom have Type 1 diabetes. TV presenter Philip Schofield, whose mother and brother both have Type 1 diabetes, and The Hairy Bikers' Si King, whose wife and son both have the condition, also contributed to the book. Jonny Labey has played Paul Coker in EastEnders since April 2015, and has also appeared in the West End musicals In the Heights and White Christmas and the award-winning film 'Soft Lad'. As well as supporting Diabetes UK, Jonny is also an ambassador for Diabetes Jersey. Philip Schofield presents This Morning on ITV and has also presented ITV's coverage of the Royal wedding of The Duke and Duchess of Cambridge, Dancing On Ice and The Cube. Chris Pennell plays rugby for Worcester Warriors and England. Si King is one half of The Hairy Bikers, whose cookery and travel shows appear on BBC2. 2In the UK, there are 4 million people who have diabetes of which 549,000 people have Type 2 diabetes but don't know they have it because they haven't been diagnosed. 11.9 million people are at increased risk of developing Type 2 diabetes and if current trends continue, an estimated 5 million people will have diabetes by 2025.